Toshiba's Satellite P500-1DZ is a big screen media centre, built for multimedia use. 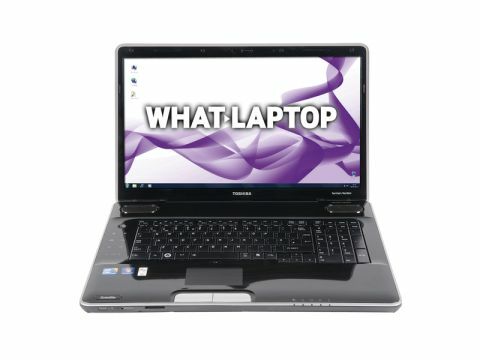 With its huge 18.4-inch screen, capacious storage and powerful graphics, it is ideal for work and play and a great choice for university studies. The thick chassis weighs a back-breaking 4.5kg, so this is not a laptop you'll want to carry outside very often. The 210-minute battery life is surprisingly capable, however, and allows basic mobility. The entire chassis is finished in glossy black plastic. While this creates an eye-catching style, it won't suit all tastes. The plastics are also particularly susceptible to scratches and smudges, and will require regular care and cleaning, which may not suit less careful students. Glossy plastics are also used across the keyboard, although fingerprints are thankfully barely noticeable. The board is frustratingly spongy to type on, however, requiring a firm strike to register. All the keys move quietly and accurately, but usability cannot match its rivals. The large 18.4-inch screen features the same hit-and-miss approach. While its size and sharp contrast make it ideal for watching movies and doing university course work, it is not as bright as we would like, failing to match the Apple MacBook Pro and Sony VAIO VPC-F12M0E/B. While on paper the quad-core Intel Core i7 CPU should prove more powerful than all but the Sony VAIO VPC-F12M0E/B, supplementary testing revealed it to provide quite a low performance in comparison to its main rivals. That's not to say it is remotely underpowered, however, as it dispatches most tasks with ease. Graphics are far more pleasing and bettered only by the Sony VAIO VPC-F12M0E/B. The dedicated Nvidia GPU smoothly runs the latest games and allows high-definition (HD) video to run with ease. Frequent photo and video editing is also easily possible. Multimedia use is enhanced by the inclusion of stereo speakers from audio specialist Harman Kardon. Audio quality is among the best in the group and music and movies sound great. A touch-sensitive control pad on the chassis's left-hand side allows easy control of multimedia files. The 640GB of hard drive storage space is generous and will provide more than enough storage for years to come. Microsoft Works software is also included, providing basic office tools to get you started during your studies. While there is plenty to like about the Satellite P500-1DZ, when you compare it to the Sony VAIO VPC-F12M0E/B, by spending an extra £100 you can get significantly more for your money, making the Toshiba difficult to recommend highly against its rivals.